The Off Grid Survival Multi-Tool is the ultimate outdoor survival multi tool. With 31 features, the tool is fully equip for any situation you might come across. Including zombies. When the goin' gets tough, this is the tool you need. With 22 important features - you'll want the Survival Companion by your side. 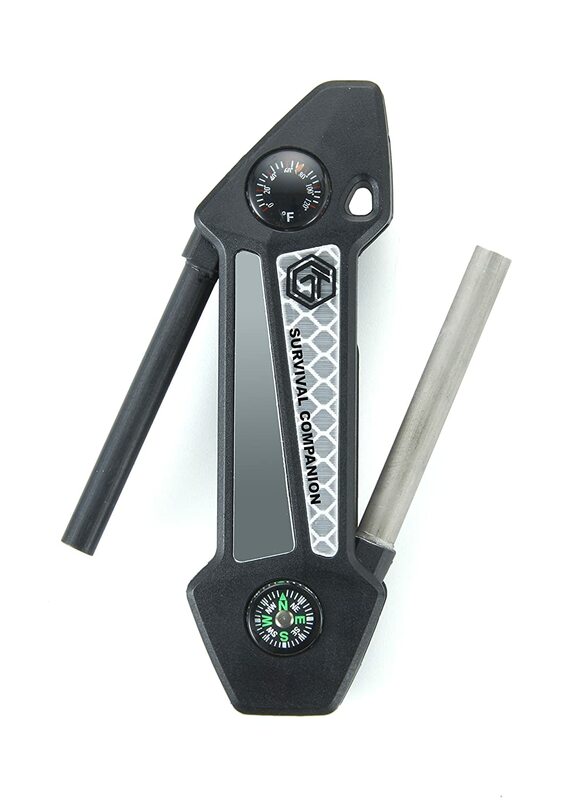 Designed as the perfect complement to the Off Grid Survival Multi-Tool. The Survival Companion is the Everyday Carry that belongs in every emergency kit and bug-out-bag. Use the tungsten carbide 'v' sharpener to maintain the blade on a knife or axe so you can build, chop and hunt. Magnesium and ferrocerium rods provide tinder and spark which will burn at over 3000° to keep you warm and safe. The emergency whistle belts out more than 100 decibels of sonic power, alerting help to your position while you can use the mirrored reflector to signal over longer distances. A built-in compass and thermometer round out the features of the main body of the Companion. The version shown here is made of durable ABS plastic. The Off-Grid Survival Multi-Tool along with the Survival Companion make the greatest do-it-all combination for every contingency.